Fields/Figures is the new CD from Colla Parte. 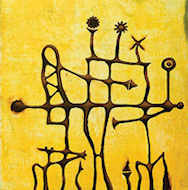 Drawing on traditions of jazz and art music, this is free chamber improvisation that moves from expressionistic intensity to reflective introversion and back again. Colla Parte loosely translated, with the lead voicea kind of music in which sounds interweave in a free counterpoint of constantly changing lead and counter-lead voicesin this case, a braiding of melodies around each other in improvised polyphony. Colla Parte the ensemble is a trio consisting of (in alphabetical order) Daniel Barbiero (double bass), Perry Conticchio (reeds), and Rich OMeara (vibes and percussion). 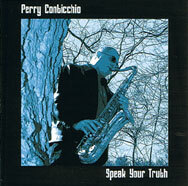 Masterfully inspired, Perry Conticchio's latest CD, "Speak Your Truth", finely illustrates his broad compositional and interpretive skills. Perry's uncompromising drive and expressive saxophone improvisations create an emotive synergy, infusing the high-energy solos and plaintive ballads with extraordinary heart. Coupled with his quartet's tight musical interaction, "Speak Your Truth" presents an original sound and a compelling musical statement, making it a welcome addition to the collection of any jazz connoisseur. 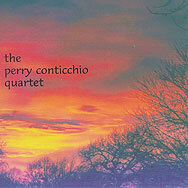 The CD consists of eight of Perry's original compositions along with contributions by fellow musician and band member Rodney Richardson and a tribute rendition of a song by Chris MacMahon, a nationally recognized bassist and close friend from Oak Ridge, Tenn. The CD is rounded out by two tunes from the American Song Book, "I Can't Get Started," by Vernon Duke/Ira Gershwin and a Sam Rivers selection entitled "Fuchsia Swing Song." The CD features the working quartet of Perry Conticchio (Tenor and Soprano Sax), Andrew Elliot Cox (Acoustic Bass), Lawrence "Bubbles" Dean (Drums), and Rodney Richardson (Guitar), with special guests Joseph Brotherton (Trumpet) and Wayne Wilentz (piano) each adorning two cuts.